Thanks so much, Rae! 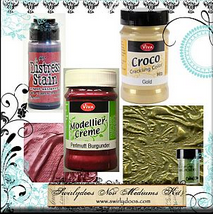 I love seeing how to use these different mediums! WONDERFUL VIDEO! Thank you for the tutorial! Thanks Rae! Love to see these how-to-videos. It inspires me to try more buy myself. Thanks for the video. These products look like so much fun.